Back in the way way back, I used to print out word text documents for my free RPGs. There was no such thing as "formatting". There was no included artwork. Back in the day (1997) you could get a Deadlands novella, a Deadlands adventure and a scenario for use with the Great Rail Wars for $4.95. 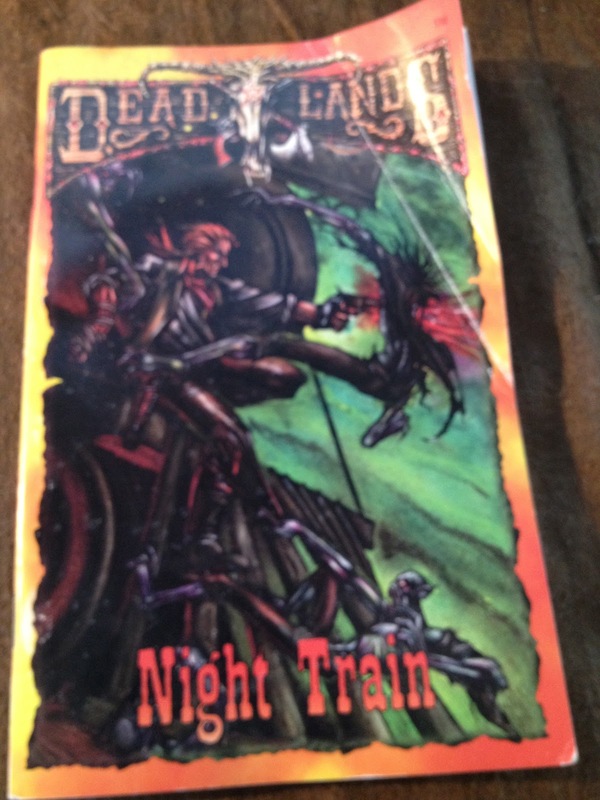 That is what Night Train is, a Deadlands three-fer. It's funny, as I'm reading over the Deadlands Reloaded core books for Savage Worlds, I realize I never really played enough of Deadlands (I think I ran one session) to really learn the system, but I have fond memories of the setting. Looking at the stat blocks in Night Train, I have absolutely no idea what they mean, but I think I could convert this easy enough to DL Reloaded. It wouldn't be a straight conversion by any means, but a working one none the less. Trying to get some cleaning done before Easter's company comes over. 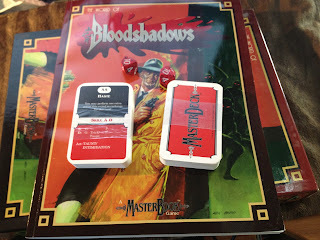 It looks like I never played Bloodshadows. Heck, I'm not even sure I ever read it as is apparent I never removed the cards from their wrappers. Interestingly enough, the Masterbook is missing from the box. I'll have to track that down before packing this away for storage. What is the Difference Between HARP and Rolemaster? I always really liked Rolemaster... as a player. I just could never find someone willing to GM it. In the end, I would find myself running a MERP / Rolemaster combo of sorts. Always fun. Always full of improvisations, as my fluency with Rolemaster was never quiet where it should have been. Back when ICE was still a publishing company (in some form) I picked up a fairly complete collection of HARP books. HARP, High Adventure Role Playing, was also published by ICE, and to my inexperienced eyes, seems damn close, if not identical, to Rolemaster. What are the major differences between the two? Is HARP closer to Rolemaster Express than the full Rolemaster rules? 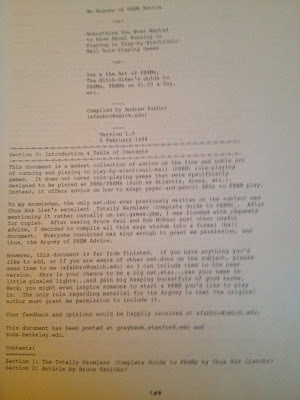 (Rolemaster Express was a nice consolidation of the RM rules). Should I keep this stuff handy, or pack it away with the bulk of my RPG stuff? Space is definitely at a premium. As an aside, I can find the HARP Sci-Fi RPG at RPGNow, but not HARP itself. Is it a dead system these days? 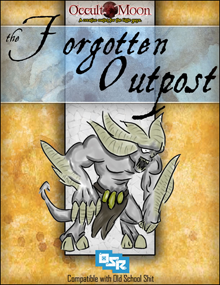 The Forgotten Outpost is a 16 page adventure from the fine folks at Occult Moon. If you don't know who they are, they are the ones that bring us a weekly dose of Toys For the Sandbox. 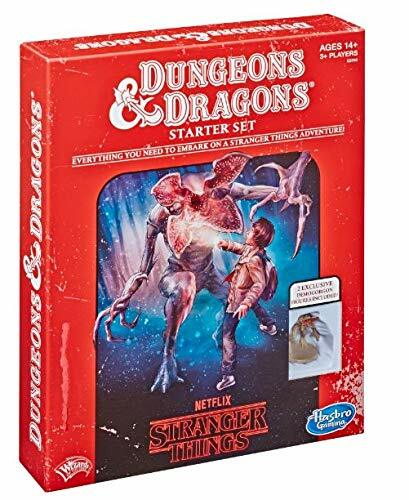 This is, to the best of my knowledge, their first full length adventure, as the Toys For the Sandbox series is more encounters, locations and / or plot hooks. So, how did they do with The Forgotten Outpost? Pretty damn well. First off is the maps from Matt Jackson. If you don't follow Matt's blog, you really should, as he is a master of the hand drawn maps. These maps are no exception. They are, as always, a work of art. Next, the adventure itself. As Occult Moon is known to do, they give you multiple plot hooks so you can fit the adventure to your party's needs. It this case, your party should be around levels 3 to 5 (Toys For the Sandbox are level-less). 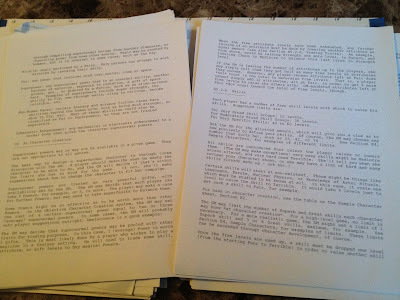 Parts that are to be read to the party are in italics. This doesn't happen all to often, so expect to be putting what the party sees into your own words, which to my mind is usually better than reading from a script anyway. The outpost, while not huge, should supply your party with a full session (if not a bit more) of game play. The ending has the potential to be a bit open ended, so if you have a sandbox you want to place this in, it should fit fine. In the hills around the city of Bear's Paw lies a long forgotten outpost that has fallen into ruins. There are many legends told about this hidden landmark, and rumors of treasures lying inside are told around warm fires. Many have made their way into the dark underbelly of this stony memorial seeking fortune and glory, but none have ever returned. 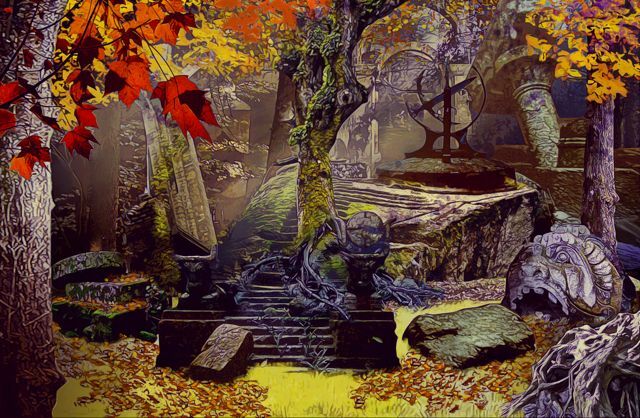 Will you be the first adventurers to uncover the secrets buried there? Be prepared for a fight as you embark on this adventure to uncover the truth behind the legends. Kobolds, gnolls, traps, and secrets lay in wait for you in this dungeon crawl into The Forgotten Outpost! 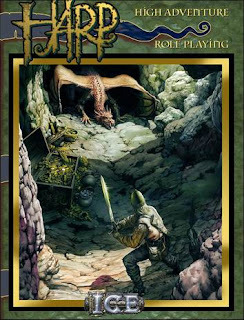 Adventure suitable for adventurers level 3 to 5 ish for what ever Old School Sh*t you play. 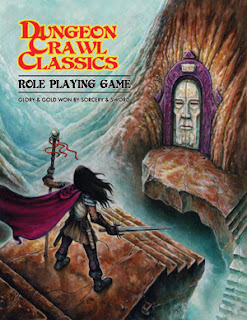 Release the Hordes of 0-Level PCs - Dungeon Crawls Classics RPG Has Been Unleashed! If you preordered Dungeon Crawl Classics RPG you better check your email. Somewhere within you should find a link to a free download of your PDF copy of the DCC RPG. First - it's massive. 488 pages massive. Second - it's bookmarked (thank the Gods!). The email refers to a problem with the bookmarking, but it appears to have been fixed. 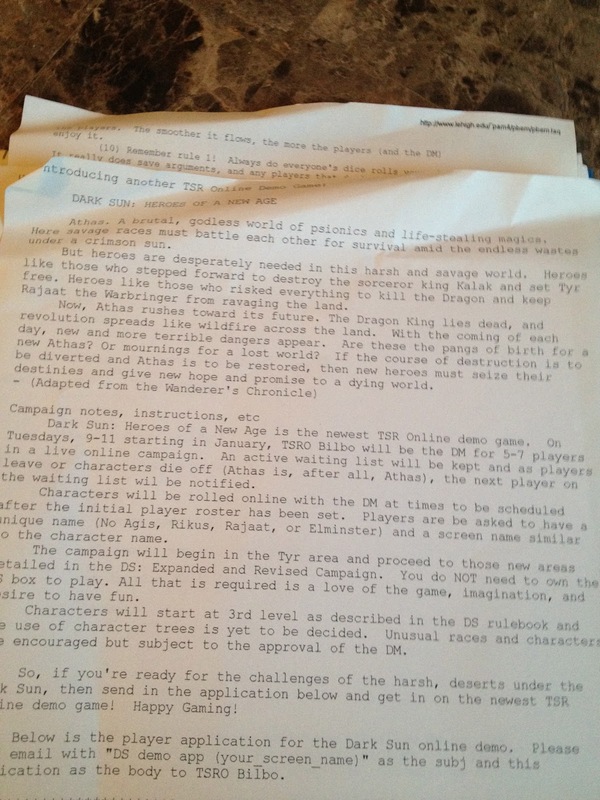 Third - having started to read the rules, I know have a better understanding of the 0-Level Horde your campaign will start off with. I'm willing to give it a try. Fourth - The art is damn sweet. Very Old School in feel. 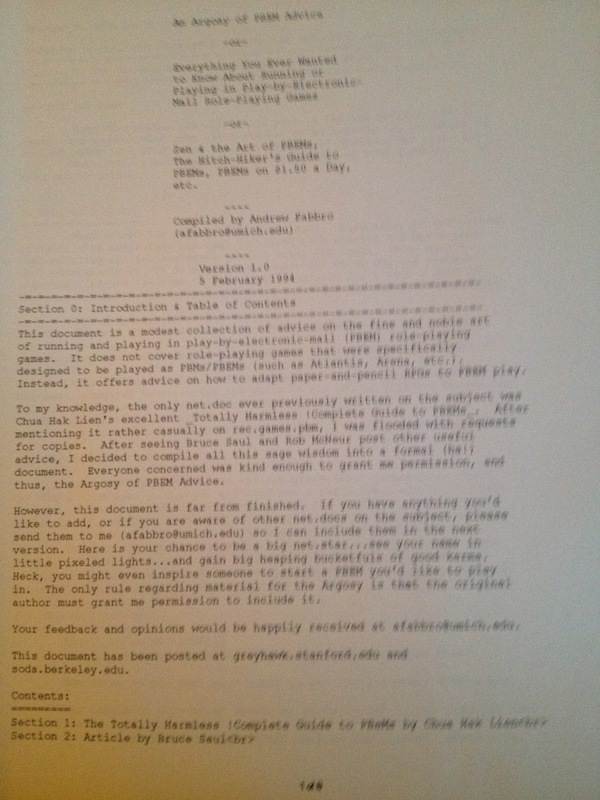 Fifth - I don't believe the PDF has been released to the general populace yet. I really feel drawn to this image. There is a story here, and I need to figure out what it is. Because when I do, it will be one heck of an image to give to my players. This could work just as well in my upcoming ACKS campaign as it will in a pulp (HEX) game, or even Solomon Kane. I'll be showcasing some of the art from Joe Wetzel's successful Stock Art Kickstarter project over the coming weeks, and I'll try an attack a small encounter or background to the art as I do post it (so far it is universally awesome in nature after my quick perusal). If Hackmaster 5e Can Do IT, Why Can't Eldritch Ent.? 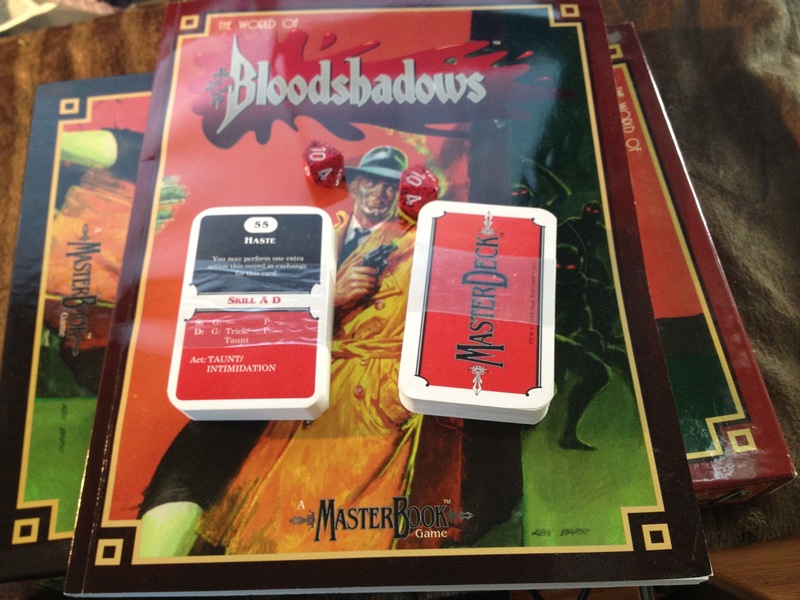 Hackmaster is obviously derived from, and compatible on some level with, the various edition and clones of (A)D&D. I guess they went the Copyright route with their game terms and numbers. Did Eldritch Ent. really need to use Power (as a %), Health and Defense (as a %). Did they even have to use %'s at all? Strangely enough, both games include an initiative modifier. I'd assume since Hackmaster Basic is copyright 2009 and it wasn't apparently challenged (and Hackmaster Advanced is to be released shortly) by WotC that they filed off just the right parts of the serial numbers. 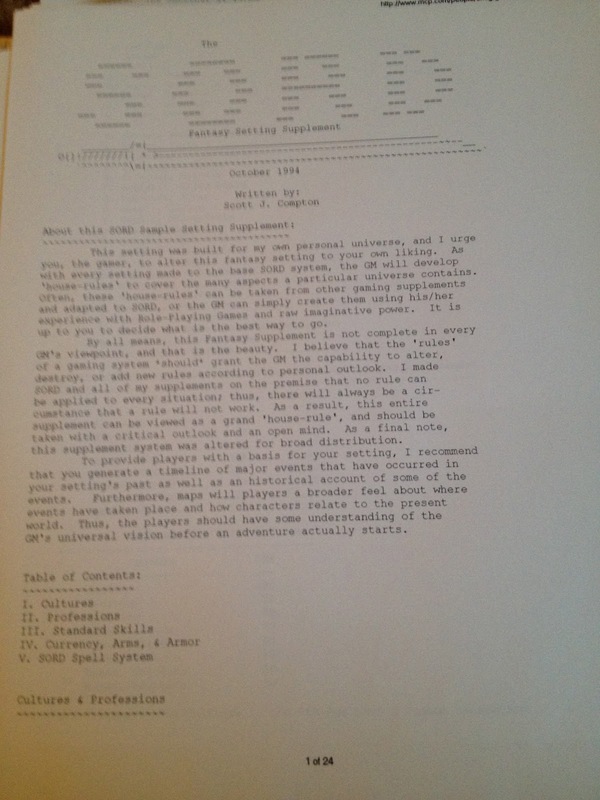 Are there any other games closely derived from (A)D&D that have gone the copyright route and avoided the OGL? Yep, another picture of the games that arrived at my house yesterday. In this case it's the five six copies of Hackmaster Basic that I ordered in the 5 for $30 promotion. I am far from complaining about the extra copy, as I gave it to my sister to give to my brother in law. This is pretty much a clearing out of old stock / possibly get new players into the fold with a cheaply priced intro product sort of thing, as Hackmaster Advanced or whatever the full product is going to be called will be released fairly shortly. Hackmaster Basic, for those that don't know, only covers characters from levels 1 to 5. The new book will carry characters through level 20. Is Hackmaster going to be my next go-to system. Nope. But for $36 including shipping you can put a copy in 5 (or possibly even 6) players hands, it makes for a very nice diversion. Besides, KenzerCo tends to do some very nice adventures (and I used to enjoy Knights of the Dinner Table until it started getting a bit stale... shame). 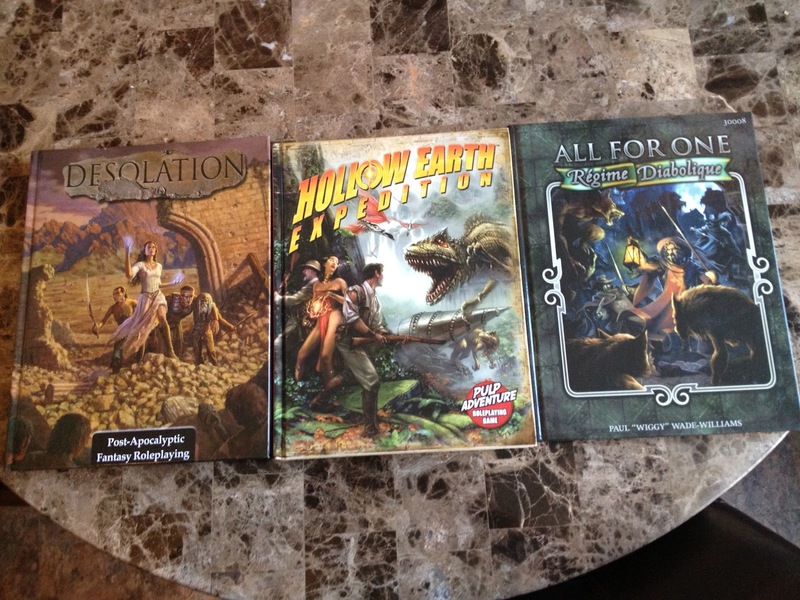 I now have my 3 core books in hand for the Ubiquity RPG System. Hollow Earth Expedition is Pulp, Desolation is a Post-Apocylytic Fantasy RPG and All For One is Swashbuckling with a nice sized Dash of Horror. 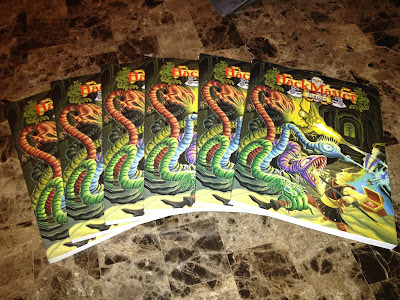 I ordered the 5 Hackmaster Basic Rulebooks for $25 and actually got 6 copies. Thank ya lads! My brother-in-law got the extra copy (lapsed gamer that he is). 32 Corridors greet the party when they descend into the first room of the dungeon. That is not a typo. 32 corridors are the exits to the dungeon entry area. They may as well flip a coin. Or coins. Wandering monsters are a major part of Lich Dungeon. Unlike most of the encounters on the outside, the party will be engaging the majority of them. Just like the random monsters on the outside, each gets a full stat block. If there is a major problem I have with Lich Dungeon (aside from the Non System Specific System used in the stat blocks) it is the stat blocks themselves. They are excessive consumers of space and in the end, page count. While not a huge deal with a PDF (as the consumer doesn't have to pay extra necessarily for extra pages) it does lead to a misleading page count. Nine pages are devoted more or less to stat blocks for the wandering encounters outside (13 pages in total deal with the random encounters). You can make an argument that encounter descriptions are included in the stat blocks, so we'll go with 6 1/2 pages for the outdoor wandering encounter stat blocks of creatures, nearly all of which are in the OGL SRD and the OSR rules of your choice and deserve maybe a line or two at max. Because, truth to tell, much of the stat blocks don't match up the OSR rules that you'll be using. So, many of you will be ignoring them. The dungeon wandering encounter stat blocks take less space, as there are less individual encounters compared to outdoors. They also include write ups of the dungeon workers, which in this case, do deserve their own stat blocks. The problem is, each room that has an encounter gives us a a full stat block. Do we real need that for Undead Skeletons? Does anyone else see the space waster this is? I will give Frank Mentzer credit, as he wanted to go with a line or two for the stats and he was outvoted by his partners (as he posted elsewhere). Frank, you were right and they were wrong. Furthering the issue is that many rooms just repeat the same stat blocks from other rooms. Then we wrap up at the end with 7 more pages of stat blocks repeating all of the stat blocks that previously appeared. I'll roughly guess at least 15 pages are wasted on stat blocks. This is that type of adventure. 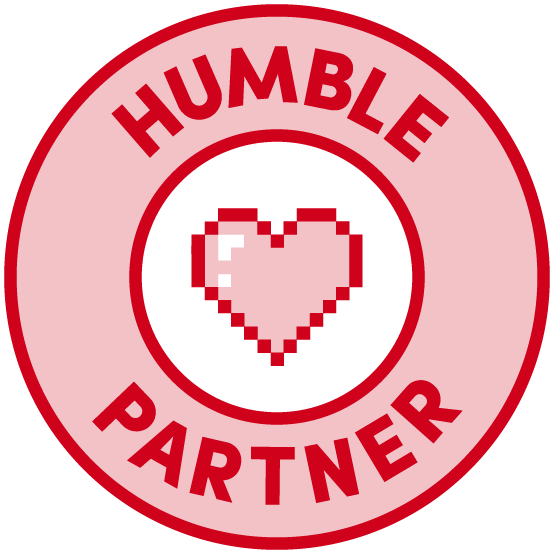 There is nothing wrong with that, as it is entirely justified by the backstory of the dungeon, but it might seem strange and awkward to new gamers. It also has traps, teleports, magic fountains (remember those?) and lots of secret doors. Very old school in this manner. How well does it pull it off? It depends on your expectations. If you are expecting something on par with a Judges Guild type of adventure (maps-wise and bit of silliness) coupled with a decent back story, you should find much to your liking. 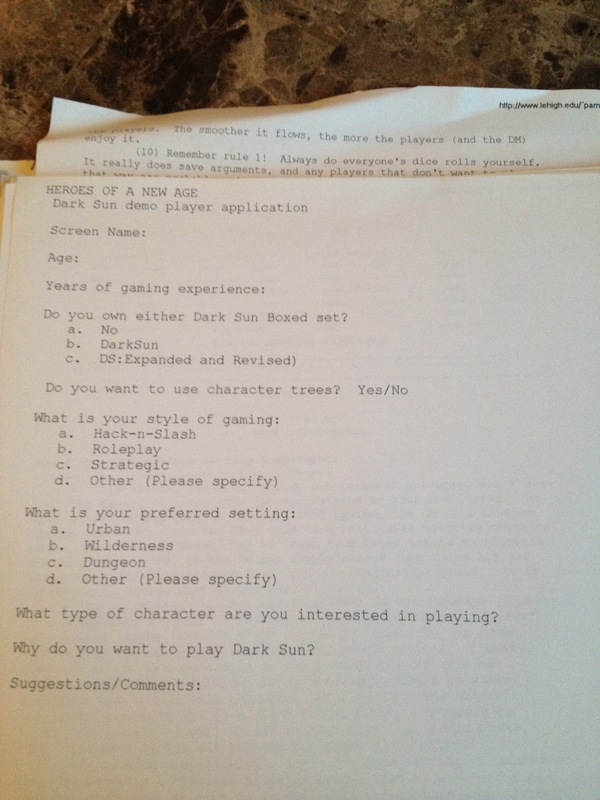 It is, if nothing else, a piece of modern gaming history. If, as someone else pointed out, you're expecting Stonehell, Barrowmaze and the like, you will be sorely disappointed. I still don't like the Non System Specific System. It's not a math issue. It's an awkwardness issue and a needless series of steps to convert to something that resembles what I need to run it. Which, strangely enough, becomes a non-issue when things converted still don't match stats in OSR rulesets. I'd suggest referring to the ruleset of your choice and ignore the NSSS stat blocks. After reading the forums at Goodman Games, it looks like the PDF is imminent, at least for the preorders. I'm not sure if I'll ever run it, but based on the playtest material there is stuff I'd love to borrow and steal for other OSR games. As I stated in an earlier post today, I've been a fan of Creative Mountain Games ever since Mark put out the 3.5E SRD. This has turned into my SRD bible, if you will. Creative Mountain Game's latest is 30 Things Can Happen! It's an assortment of random tables to add flavor to your adventures as they are happening. They add the little things that bring life and spontaneity to the world your party is adventuring in. You get 30 tables broken down by category: While in a City, While in the Country and While Underground. Each table is further broken down by thirds. So, depending on how you look at it, you have 30 tables with 30 entries each, or you have 90 subtables with 10 entires each. Priced at $4.50, you are effectively paying 15 cents a table (or 5 cents a subtable). A fair price in my humble opinion. Never be at a loss again with these thirty tables of random Medieval Fantasy events and findings in urban, rural, and underground locations. Each thirty entry table is divided into three ten entry categories, some with additional sub-options, making for nearly one thousand random results including the fun and fantastical. Use these pages to help flesh out locations during prep or to perk up a flagging game session. This invaluable resource is system-free and ready to help with any fantasy roleplaying game. I have some mini-reviews in the hopper (as Lich Dungeon is taking a long time to do a proper review). 30 Things Can Happen is 34 pages of 30 entry random tables to flesh out encounters and "background noise" for your games. It from Creative Mountain Games (Mark's SRD 3.5 Revised is still my go to reference for all things 3.5). Resolute: Legacy is 40 pages or so of superhero goodness. I'm not big on supers (and haven't checked out the new Marvel Supers game, but that may change as things slow down) but Splintered Realms Publishing has put out some very good, short and inexpensive RPGs in the past. At less than 2 bucks I'll be giving this a peek. If you purchased a copy of the Castle Keeper's Guide for C&C in PDF from RPGNow (remember the feedback on the pricing of that one?) you should have gotten an email from the Trolls with a link to a free copy of A Lion in the Ropes, an adventure for C&C. Oh, and I still have some catching up to do with the Toys For the Sandbox Series. 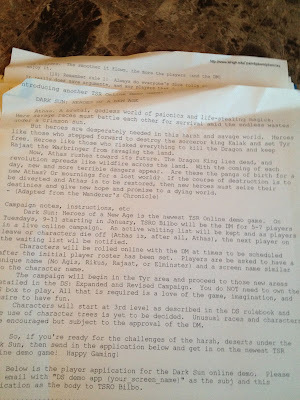 Can't forget more reading of the Ubiquity line of RPGs. God, I'm really enjoying Hollow Earth Expedition, and I'm not a big pulp fan. I had a number of blog post titles going through my head on this one. "You Can't Go Home Again", "The Times, They Are a Changin' ", but I think this one works best. As I read and review Frank Mentzer's Lich Dungeon, I've come to see that the OSR is not so much merely a cloning of the original D&D rule sets, but an updating of the original rulesets and creating new accessories to the expectations of a modern audience while remaining true to original rules. Lich Dungeon is a piece of gaming pretty much frozen in the time of it's conception and design. For that time, it may have been one of the better adventures of it's type. I'm not sure how well it translates to this time, our time. Sure, we are using the same rules (even if Eldritch Elm. felt a need to scratch the serial numbers off of it) for the most part, but the expectations are different. Maybe we've matured as a hobby. Maybe it's an evolution, even if we never saw it or expected to apply it to the original rules we are so fond of. I'm not sure. If I wanted to pull T1-4, ToEE, I could do so, and because I ran it last 20 plus years ago, my expectations of it seem to have changed with me. My mind has already worked out the changes I'd need to make it for it to work with an older rule set but with today's expectations. Lich Dungeon is seeing the light of day for the first time now, but it is very much a product of "then". It's a snapshot of the past. When I hit the last part of Lich Dungeon's multi-part review, I suspect I'll be giving it two overall ratings. How it compares to similar products of the time it was conceived, and how it compares to similar products in the time it was birthed. I'm not so sure how close that range will be at this point. Guess I won't know until I write it. And now Part Two of Lich Dungeon Level One's review. To get into Lich Dungeon your need to talk to a pair of trees (it's a riddle / puzzle of sorts). I don't think this will be spoiling anything for anyone reading this, as this needs to be established with the players when you feed them the seeds and rumors they will need to embark on this adventure. It works surprisingly well in this context. As I said in the first part of this review, this adventure is a few notches to the silly side. As long as you accept that (or adjust the adventure to remove such, which is easy enough) you should be fine. Just because things have a little silly to them doesn't mean they aren't dangerous or even potentially lethal. Mr Mentzer does a fine job describing describing the environment of the dungeon so as to prepare the DM for running the adventure. It should allow the DM to fill in details as needed when requested by the PCs without having to do much on the fly. Floors, walls, doors, hasps, locks and the like are all covered in their various forms. Also included is the nuts and bolts behind the workings of this dungeon. As I said in the first part of this review, it is not you standard dungeon. There are work crews that maintain it and repair it. It is a dynamic environment. It is quite possible, even likely, that the players will encounter those that keep Lich Dungeon in top notch form (remember, it is a heavily explored and traversed dungeon). You will have all the tools to do so. Gee, two parts into the review an I'm not even to the dungeon itself. Nothing Much Going on With Mike Mearls' Latest Column - Levels Oh My! Mike had an informal poll via Twitter that revealed that 12th level is the ideal level to max out a campaign. If my memory serves, in Adventurer Conqueror King System, classes top out between 12th and 14th level. Tavis, did you need to do a poll to determine that? Wait for it... wait for it... Mike asks the question (there is a poll attached to the article too) should gameplay change at high levels to accommodate traveling the planes or perhaps even ruling a domain? I think ACKS has the domain play down pretty well. All WotC needs to do it resurrect The Lady of Pain and the rest of the Planscape setting and they're all set. Here's the link to the article. It's short. KISS, otherwise known as Keep It Simple Stupid is something that has been drilled into me at least since High School. Don't over complicate things needlessly. If you can find a simple solution that works, use it. Complicated solutions may impress yourself, but they aren't going to be fun for anyone that comes behind you. This is not dumbing things down for The Lowest Common Denominator (which I've come to believe is WotC's plan for D&D 5e). Dumbing things down doesn't just change the process, it changes the result. KISS is an attempt to attain the same result using a simpler process. Most of the OSR is built on the KISS idea. 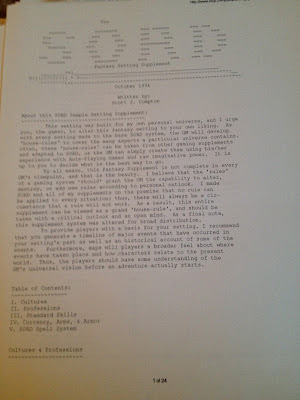 D&D / AD&D may not have been the most clearly written games, but the OSR rewrites have been able to attain the same results with less confusing "packaging". Savage Worlds, and even more so Hollow Earth Expedition, really exemplify KISS. It's the reason I'm going gaga over the two these days. Apocalypse World, on the other hand, takes a very simple system and surrounds it with obtuse wording and descriptions. It makes a system that by it's nature is KISS very non-KISS like. Which is a shame. As I've said before, AW plays SO much better than it reads. Sometimes we are too attached to our own creations, no mater how large or small, to see that we didn't give KISS a chance. It takes a second set of eyes to point out the shorter path to the same destination. This is what happened when Keith Davies took my Critical Hit table, cleaned it up and removed the need for an additional roll. Clean. Quick. Simple. 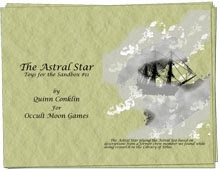 The Astral Star is the 11th installment in the Toys For the Sandbox series of... not quite adventures, but more like stories hooks and adventure seeds. I believe as I write this, Occult Moon is up to 13 in the series, plus a free "Issue Zero" and a bonus that those that grabbed the freebie in the first 24 hours were eligible to receive. Yep, its a pretty lively series. The Astral Star takes the series to new heights and new dimensions. This is one that would benefit if you could place some rumors and seeds a few sessions (or longer) in advance, as it would really make for a larger impact on the PCs if it could be successfully pulled off. The hooks (and twists) are really, really good this time around. With a little work, some could be used to decent effect as seeds to encounters or adventures of your own design. That is the one shame of this series. Six hooks, each with 3 twists gives you 18 possible ways to get your party involved. Since you will only use one, you have 17 that laying there, wishing they were used. I'm already thinking of ways to use a handful of the ones I won't be using in different set ups. The Astral Star deals with the Astral Plane (not a big surprise there), but I don't want to spoil the major twist here. I really do like it. 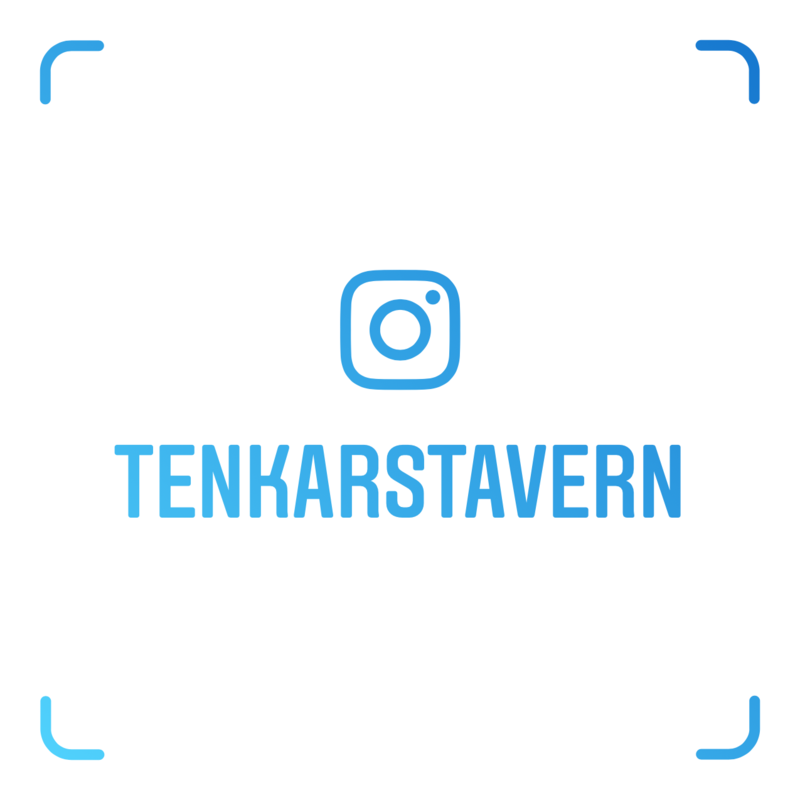 It's very innovative and can certainly lead to a whole chain of events for your party, either immediately or in the party's future. Best of the lot so far IMHO. I've liked them all, loved a bunch, but The Astral Star beats them all. Oh, and I label this "Generic OSR", as it is most certainly drawn from and OSR mindset and gaming history even if there are no stats included. This week we explore the wreck of the Astral Star, a legendary ship filled with heroes that disappeared a long time ago. I told Frank Mentzer I would give the Lich Dungeon (his new release) an honest shake and review it, so I am. It is an 88 page PDF, so I'm going to do this in parts, which in my mind seems to work. Part 1 will deal with the history of the dungeon, both it's fictional history and it's history as a dungeon that Frank began running in the 70s. It will also deal with the alternate stat block used by Eldritch Ent. as well as the encounters around the entrance to the Lich Dungeon. Oh, and the technical stuff and editing. Part 2 will deal with the dungeon itself. The PDF lacks hyperlinks or bookmarks. If this were a rulebook, I'd be fairly upset, but with an adventure that comes in at 88 pages I can like without the bookmarking or hyperlinks. They would be a nice addition, but they aren't needed and the lack of such does not detract from the product. The introduction is priceless. It's a short piece of in game fiction that gives on a solid idea of how such a magical dungeon can and does exist, how it got to it's location, the hows and why of it's occupation by various monsters and even it's up keep. I have to admit that I smiled upon reading it. It is a few notches towards the silly side, but many an Old School adventure were a few notches towards silly. Besides, I'm a big fan of Tunnels & Trolls, and that system encourages silly in it's fantasy. Nomenclature is where all the little bits get explained, such as bold text is to be read to the players and elves are called "olves". It is also where the non-system specific stat block used in Eldritch Ent. products is explained. Suffice to say, I don't like the "generic" stat block that EE has invented. The additional math, although not horribly complicated is not intuitive and doesn't match up in all cases to OSR rulesets. My suggestion is to either ignore the stat blocks and use the ones from the rules you are using, or go to this link supplied by Frank Mentzer himself updated as per Frank Mentzer. If you are expecting a bunch of hooks to get your players to the dungeon, you'll need to think of them yourself, as none are supplied, at least not directly. Remember the introduction? The hooks are there, you just need to extract them. The area around the dungeon is a living, breathing environment with it's own ecology of sorts. There are intelligent creatures that pray on adventurers (at least, the wounded parties laden with treasure - no point in killing an unfattend calf). This is also the first place you find these new stat blocks in action. Even if you plan to ignore them (as I do) the Demeanor and Appearance aspects of it are very useful in playing out the encounters. Most are not lethal UNLESS the party decided to make it so. Discretion is very much the better part of Valor in most of these. They are not balanced to the party, but for the most part that shouldn't be an issue so long as the party plays it smart and knows their own limits. TPKs are definitely possible for the foolish (and it's even mentioned in the text as such). There is a trick to entering the dungeon which is best set up as a rumor or rumors for the players to pick up before arriving for the first time, or it may be a long time before they get to enter. As there is a decently sized population of adventuring parties using these dungeon, rumors shouldn't be a problem to plant ahead of time. Thus ends the first part of my review of Lich Dungeon - Part 1. 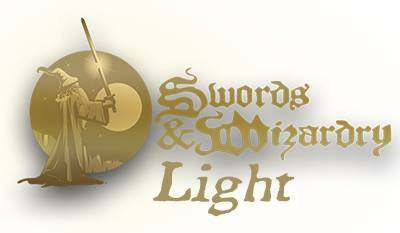 By now you've probably heard that Frank Mentzer, Tim Kask, James Ward and Christopher Clark have started a new publishing company named Eldritch Ent. Or maybe not. Their products just hit RPGNow on March 29, so this may still be news to you. So far their products claim to be non-system specific. Since it was mentioned in a comment on G+ that the non-system specific stat blocks didn't match up to anything, let alone convert to anything, I decided to download some of the previews to see what was being talked about. I was left scratching my head. How can a product be non-system specific when it includes stats to a system that don't match up to any system (or at least none that I know of, and I know of a lot ;) ? Is it a mash up of lots of systems? Made up on the fly? What we can work out from the above, if we were using this as a reference in the OSR game of our choice? Health would convert to HP, but then we have a problem. In S&W, wraiths have 4HD, for an average HP of 18 and a max of 32. These uber-wraiths have 51-60 HP. Nearly 3 times the average in S&W. Ouch. Defense - Obviously converts to AC in some manner. No Idea what that manner is. Or maybe it doesn't convert. Init - Some creatures have a number greater that Zero here. Converts to nothing in the OSR that I know of. Damage - matches S&W perfectly. Special - doesn't match up with the description in S&W at all. Appearance - effective way to describe to the party. Oh, and (7) seems to be the number appearing in the encounter. Now, I am not a world famous game designer, let alone one of four such world famous game designers, but why would you invent a system to stat out your encounters that doesn't come remotely close to matching up with the OGL / OSR / D&D setup? Okay, maybe you don't want to use the OGL for some reason. Too restrictive or something. Maybe you don't want to link yourself too closely to a system that may have done you wrong in the end (Clark, I'm talking about you here). If you wanted to do generic adventures than leave the stats out of it! It really is that simple. I don't like the idea that I need some unknown rosetta stone to covert your stuff to something I can use in my game. "Just ignore the stat blocks if they don't apply to you" will be the argument I am sure. Guess what? Since they are useless to 100% of your consumers, you should have left them out in the first place. And yes, looking at it on this page, it is a page filler or page count fluffer. What would be a line, maybe 2, is 14 here - 11 if you remove the page breaks. Damn shame.